This guide will teach you how to become a Ninja on Club Penguin! A Ninja is a highly skilled penguin who has mastered the arts of Card-Jitsu in Club Penguin! Card-Jitsu is a game which will enable you to battle many different penguins will the elements of fire, water, and snow, and earn belts along the way, once you get your black belt, you must challenge the Sensei, to become a full Ninja! From there, you can enter the Dojo, in which you will train to become a Ninja! Here's how to start. 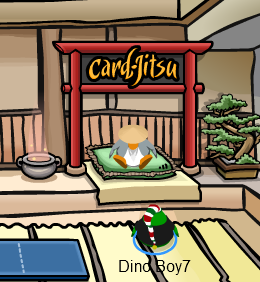 Click on the chair that says 'Card-Jitsu' on it. It will have the Sensei sitting on a green cushion. From there, you can battle other penguins to earn your belts! You must make sure that other penguins are on that server or you can't battle anyone! Battle other penguins in Card-Jitsu to earn your belts. 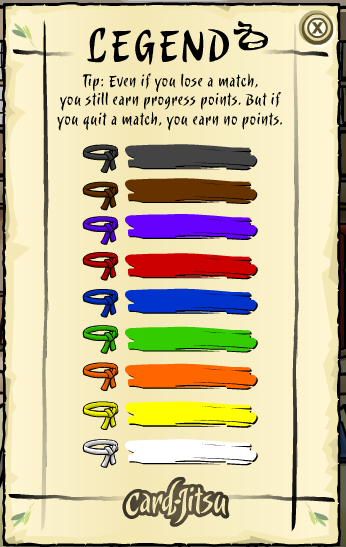 Here is the order of the belts you can receive. You must take part in many games of Card-Jitsu to earn these belts, one by one. Once you have earned all of these belts, you must challenge Sensei to win your Ninja Mask, and finally become a Ninja on Club Penguin! It takes many games, but in the end you will defeat him! Once you have, he rewards you and you can enter the Ninja Hideout! This is a special place only for Ninjas, where you can buy Ninja items, then go on to become a Fire Ninja, Water Ninja, etc. Enter it from the Dojo Courtyard.